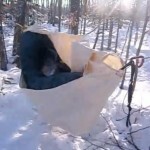 I thought I would explain how canvas and breathable insulation works in extreme cold. FourDog, Mors and others say, “20*F and below, use breathable footwear and outerwear. 20*F and above, use waterproof footwear and outerwear.” Sometimes they use 10*F as the breakpoint. Whatever temperature you use, the concept is intuitively obvious. Still, I wondered, why won’t other materials work as well? Why canvas? There have been several threads on the continuum of waterproof vs breathable. There is a third leg to that stool: windproof. Canvas is highly windproof and highly breathable. Untreated canvas doesn’t handle water well. Other fabrics are water resistant, windproof and breathable, but none are as windproof and as breathable as canvas. Why does that matter? It all became clear to me when I realized what temperature differential we have between our bodies and the ambient conditions. At -15*F, there is a 100 degree difference between our skin and the air! If it’s 85*F at your skin, and -15*F outside, that’s 100*F difference… that’s huge! Still, why does that make canvas so special? Everyone has heard that nature abhors a vacuum. Nature also abhors a differential. When ever there is a difference in something across a boundary, there is a natural driving force to level it out. This works with water levels, salt concentrations, and many other things, including temperature differences. Temperature differential is the driving force of heat transfer. The higher the temperature differential across an insulator, the more heat will be lost through the insulator. What makes this important in extreme cold weather is the other differential, which works hand in glove with temperature: humidity. Inside your toasty nest, it could be 50% relative humidity or higher. Outside your hammock and all of your insulation, it could be -15*F and 30% relative humidity or much lower. That is a relative humidity differential of 20% or more. However, it is a much larger humidity differential that you would think, just looking at relative humidity. At 50*F and 50% relative humidity, the absolute humidity is 25 grams per cubic meter. Compare that to -15*F and 30% humidity, where the absolute humidity is 0.5 grams per cubic meter; there is only a trace of water vapor in the air outside! That is a gigantic difference! Essentially, the conditions inside the hammock are tropical, while outside it is a frigid desert. The canvas will keep out the cold wind, but allow the moisture through. The trick is to get most of the moisture to go right through your insulation in the vapor phase, without condensing and making ice. For that to happen, a highly breathable outer layer is required. Canvas doesn’t inhibit the flow of water vapor through your insulation, so it allows the water vapor to escape into the air without much condensation. Of course, your clothing and hammock insulation must be breathable for all this to work. For instance, if you have a vapor barrier under your hammock, that stops the moisture cold, so to speak. With luck, you won’t find ice crystals there when you hang in Minnesota! Think about what happens if you use waterproof boots in extreme cold. There is a lot of water generated by your feet when you are active. (“Over 2 cups per day!” says FourDog.) If your boots are waterproof, that water stays in. It gets into your socks and the insulation of your boots. Then, you remove your foot and go to sleep. If you don’t dry out the inside of your boots, all that water will freeze. 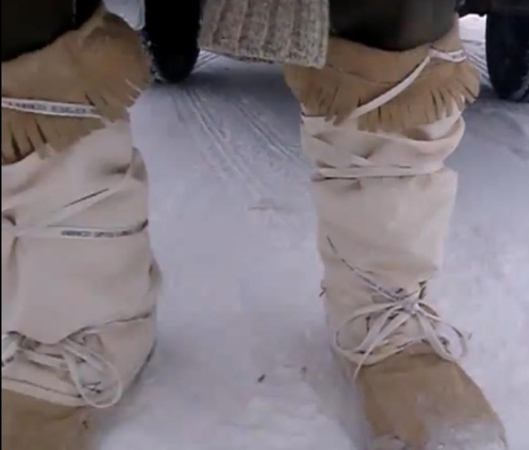 OTOH, canvas and leather mukluks are highly breathable, so the moisture goes right out into the ambient air, so that socks and liners are relatively dry when you remove your feet. Extreme cold air will dry you out fast. That’s why we have to rehydrate more than normal in those conditions. We make that attribute work to our advantage when we use breathable insulation covered with canvas. We get that cold air to pull the moisture right out of our insulation, without condensing, so that our insulation doesn’t collect ice crystals, and remains in top condition to keep us warm. Of course, there is another side to this story, and I welcome folks using that as well. I just wanted to explain what I have learned about breathable systems with canvas, and why it works. It has been a lot of fun making traditional anoraks, mukluks and hammock socks using canvas, and seeing them work just like they are supposed to do. I hope this helps folks understand why.